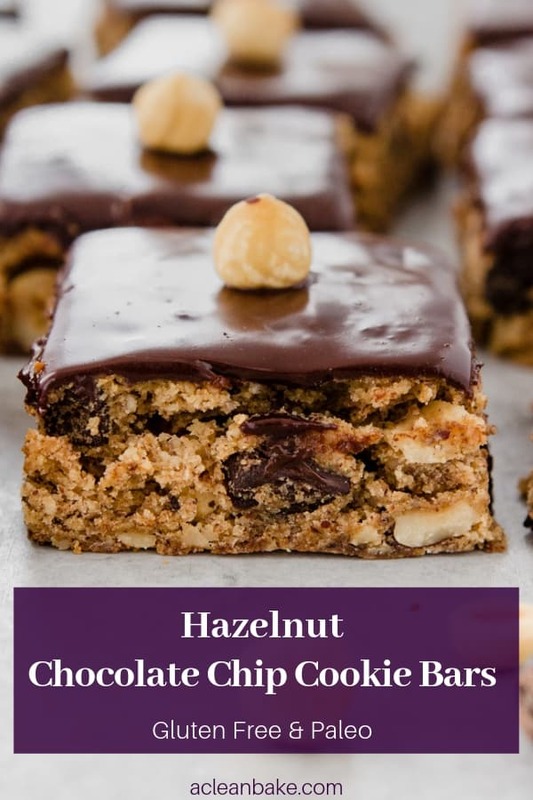 Hazelnut chocolate chip cookie bars are a little something different for your next cookie tray! 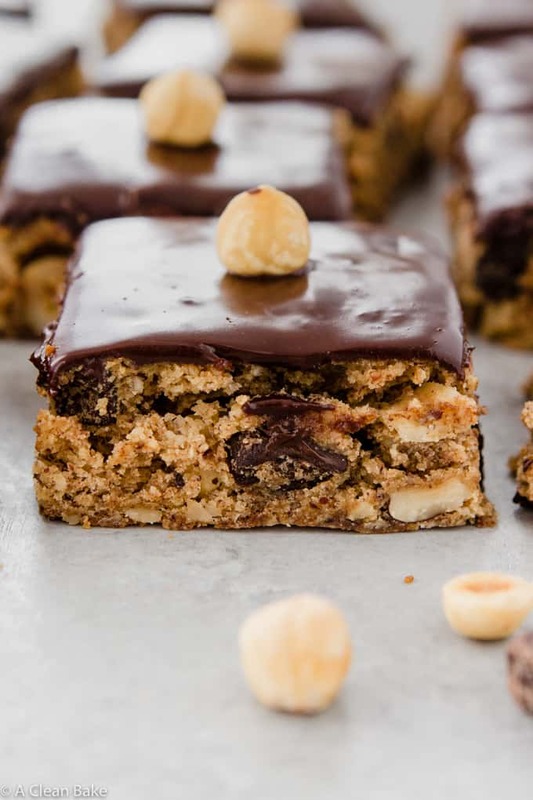 These bars boast the familiar flavor and chewy texture of a chocolate chip cookie, complemented by fragrant and festive hazelnuts, but are baked into easy-to-serve bars. 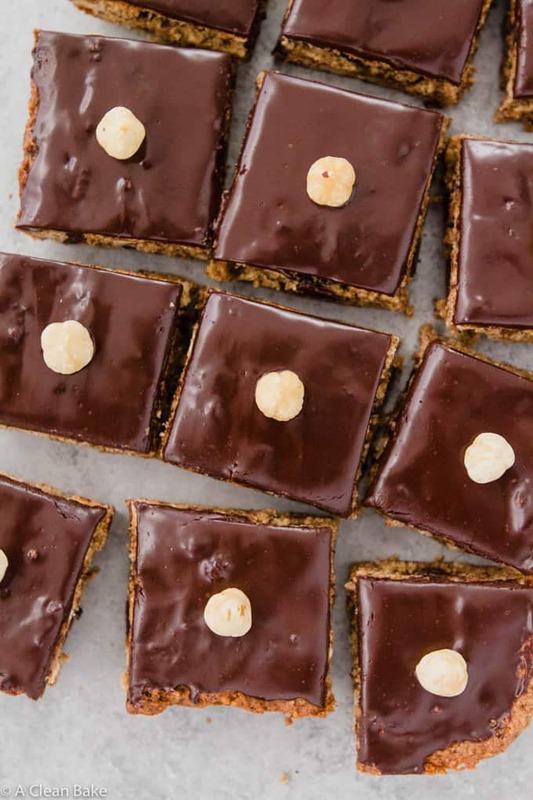 To make them extra special, cover them with a smooth, rich layer of homemade dairy free chocolate ganache and top each bar with a whole hazelnut! If the height of summer tastes like perfectly ripe, just-picked tomatoes, still warm from the sun, and the peak of fall tastes like pumpkin, spiced with cinnamon, nutmeg, and cloves, then Christmas tastes like hazelnuts. Some might say peppermint or gingerbread. Or perhaps I should think fruitcake, or stollen, or the anise in my Italian grandmother’s biscotti. But for no reason other than I feel it, it’s hazelnuts. They feel so special occasion-y, due to their relative scarcity (compared to your every day almonds or cashews), their rich and elegant flavor, and – let’s face it – their special occasion price tag. So, I save them for the holidays – the bright, sparkly last days of the year when anything goes, so hazelnuts for everyone! – but each year, am reminded how damn good hazelnuts are in desserts, so vow to use them (sparingly)(wallet permitting) throughout the rest of the year. Perhaps I could reward myself with them when I learn to write in a form other than a gratuitously run-on, confusingly scatterbrained sentence? My third grade Language Arts Teacher is probably somewhere weeping right now. What does this have to do with hazelnut chocolate chip cookie bars? But you promised me chocolate chip cookie bars! And here they are, in all their soft, slightly cakey, crunchy-from-the-nuts-but-also-gooey-from-the-chocolate glory. I promise; I’ll focus now. Some might call these blondies but they are, in fact, chocolate chip cookie bars. What’s the difference, you ask? Well, the internet might tell you a lot of things, but the gist of it is this: the difference between chocolate chip cookie bars and blondies boils down to texture and flavor – and a little bit of personal preference. Texture. Blondies should be much denser – nearly fudgy brownie-like – in texture. They are a “blonde brownie” whatever that means. (Not to be confused with a white chocolate brownie, which is a whole other kind of recipe entirely.) These chocolate chip cookie bars, on the other hand, are decidedly cake-ier with a large crumb, not unlike (you guessed it!) a chocolate chip cookie. Flavor. I found some anecdotal evidence on the internet (so, take it with a grain of salt) suggesting that true blondies *must* have notes of butterscotch flavor, from the brown sugar-sweetened base. 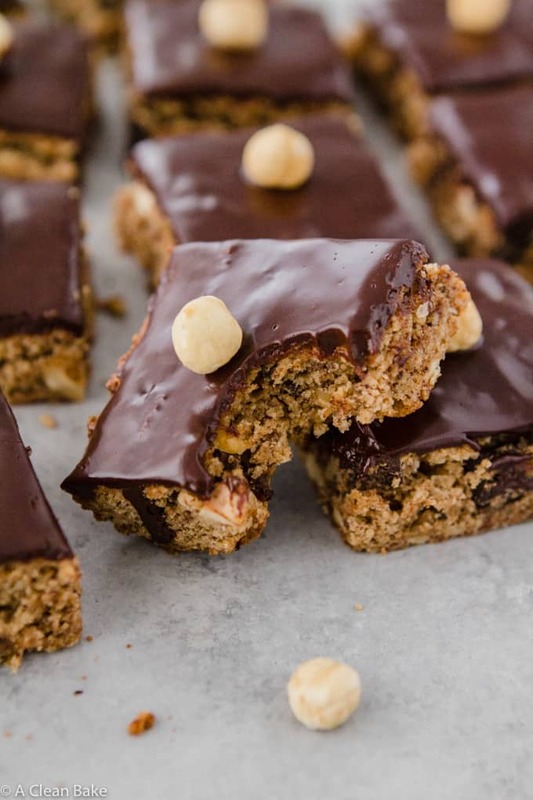 I can neither confirm nor deny the flavor as an essential distinction of a blondie, but since this recipe isn’t very butterscotch-y, let’s play it safe and call it a bar. Sweetener: I get a lot of questions about replacing sweeteners in many of my baking recipes and, in this case, you need to use the maple syrup called for in the recipe. You can replace it with honey if you must, but unfortunately, you can’t use coconut sugar, raw sugar, stevia, or monk fruit in this recipe. 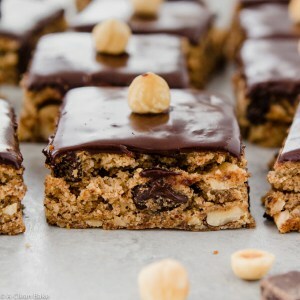 Chocolate: Although these are called chocolate chip cookie bars, I highly recommend using dark chocolate chunks or chop up a dark chocolate bar (at least 60%, but as dark as you like!) for the chocolate in this recipe. In order to get the wells of chocolate that really make these chocolate chip cookie bars outstanding, chips are fine, but chunks are better. Feel free to use dairy free chocolate if you need to. 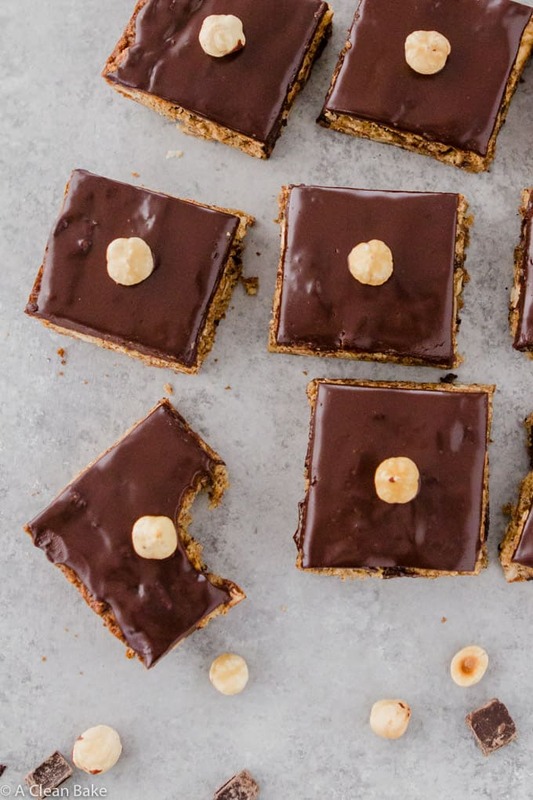 Hazelnuts: I used raw hazelnuts in this recipe, but if toasted is all you can find, it shouldn’t be a problem. Use blanched (skin removed) hazelnuts, if you have the option. But if natural (skin on) is all you can find, don’t let that stop you from making these bars! The nice thing about these chocolate chip cookie bars is that you throw the ingredients together in a stand mixer, pour the batter into a pan, bake, and slice. That’s all! Perfect for any time of year, but especially this busy week! Preheat the oven to 350°F. Lightly grease an 7"x11" rectangular baking pan and set aside. In a medium mixing bowl, whisk together the flours, salt, and baking soda. Set aside. In the bowl of a stand mixer fitted with the paddle attachment, beat the maple syrup and almond butter until smooth. Then mix in the egg and vanilla. Add the dry (flours, salt, baking soda) mixture to the bowl of the stand mixture and mix on low speed until just combined, stopping periodically to scrape down the sides and bottom of the bowl. Fold in the hazelnuts and chocolate. Pour the dough into the prepared pan and smooth into an even layer. Bake for 30-35 minutes, until a tester comes out clean. Cool completely, before pouring the ganache (warm, so it is still liquid) over the top, and placing the additional hazelnuts, evenly spaced, in a grid pattern across the top. 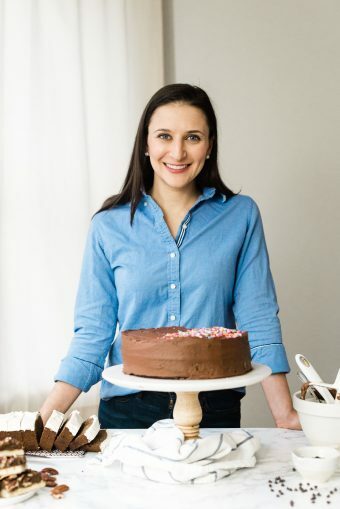 Allow ganache to set before slicing and serving. Store leftovers in an airtight container at room temperature for up to three days, in the fridge for up to a week, or in the freezer for up to a month. Hazelnuts are one of my favourite nuts, although I haven’t seen Hazelnut flour here in the U.K. That’s ok as I can grind them in the food process. Absolutely delicious recipe and I have started a new Pinterest board especially to Pun these! Yes, you can definitely make your own flour in the food processor! I hope you love these! This is an amazing recipe, Nora! If you did not know better, you would assume there is not a single healthy ingredient in this dessert. Thank you, they were truly outstanding. THANK YOU!! That is so wonderful to hear!